If there was one constant during my six-and-a-half years in prison (apart from bad food), it was being surrounded by thousands of mostly African-American and Latino men doing sentences like twenty, thirty or forty years for drug-related crimes. One friend of mine was twelve years into a stint of 555 years for money laundering. I knew something sinister produced all this but I couldn’t quite make sense of it. Upon my release in 2009, I landed in Champaign. The first book I read when I got here was Michelle Alexander’s The New Jim Crow. Suddenly what I’d seen on those prison yards became clear. 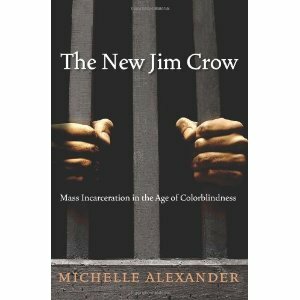 There was something sinister happening: what Michelle Alexander calls The New Jim Crow. For Alexander, the ferocious campaign of prison building and locking people up that has engulfed the U.S. in the last thirty years is a new form of racial oppression. She compares this New Jim Crow to slavery and the old system of segregation (mostly) in the South, known simply as Jim Crow. Her argument is powerful and has reached well beyond those who have walked the prison yards. By now it is likely the best selling book in U.S. history on the criminal justice system, having spent a year on the New York Times bestseller lists. She begins her argument by chronicling the horrifying statistics of the rise in incarceration in the US―300, 000 people behind bars in 1980, more than 2.2 million today. The racial dimensions of this are even more shocking: three out of four young African-Americans in Washington D.C. can expect to serve prison time; in many states we have more young black males incarcerated than in college; while white drug usage and involvement in drug sales on a per capita basis are at least as high as those of African-Americans, blacks are imprisoned for drug charges at rates of up to fifty times that of whites. The War on Drugs lies at the center of her tale. Behind it all she places political moves in the early 1980s by conservative elements in the Republican Party. Their goal was to woo working class whites away from the Democrats. Alexander describes how Reagan and other Republicans correctly surmised that the rebellions of the ’60s, especially the civil rights movement, struck fear into the hearts of large swaths of the white population. These whites were poised to abandon their Democratic political home and jump to the Republicans. To facilitate this shift in party loyalty, conservatives succeeded in labeling the Democrats as the party of civil rights, welfare and affirmative action: i.e., the party of the minorities, not the white moral majority. The vehicle to convince wavering white Democrats of the need to jump party ship was the creation of the “criminal,” alternatively labeled dope pusher, gangbanger or carjacker. However, unlike in previous eras, these new villains were not depicted in explicitly racist terms. Alexander refers to this phenomenon as “colorblindness”―a process where symbols and codes substitute for racist terminology and categories. While there was no doubt that these terrifying “criminals” were young black males, this was never stated. The U.S. could pretend to be beyond the days of racial discrimination, to be a post-racial society. Nonetheless, colorblindness didn’t make the results more palatable. Punishment became the gospel and “Lock ‘em up and throw away the key” became the refrain in the halls of justice, on police beats and on the campaign trail. Harsh laws such as mandatory minimums, Three Strikes, and Truth in Sentencing ensued. Then came financial incentives: federal funding for local drug squads followed by another carrot, allowing police department to keep the proceeds of drug raids. Drug arrests became a cash flow bonanza for police forces across the country, a chance to upgrade departmental resources while rounding up more POWs for the prison system. All of this landed many of those thousands of people I used to walk the yard with in the clutches of the prison system. But, as Alexander emphasizes, oppression doesn’t end when we exit the prison gate. “Felons” are less than full citizens. In many states we are unable to vote (we can in Illinois), hold office or serve on juries; we are often banned from accessing public housing, workfare or food stamps. In addition to being second-class citizens, we also carry the shame of “convict” stigma, often leading to social isolation in our communities and even within our families. While the New Jim Crow focuses mostly at the national level, those of us in Champaign-Urbana Citizens for Peace and Justice have uncovered the New Jim Crow in our county. While massive prison building programs are the driving force for mass incarceration at the state and federal level, in local communities, expansion of jails has been a flip side of the same coin. So early last year when Sheriff Dan Walsh and others came forward with an idea to spend $20 million on a new jail in Champaign County, alarm bells went off for many of us. We suspected that any new jail would end up housing largely poor African-Americans and undocumented immigrants. We did the research. We already knew that African Americans were more likely to be targeted for traffic stops. But to our astonishment from 2007 to 2011, more than 50% of those admitted to our county jail were African-Americans, though they made up only 12% of the county’s population. We called this the New Jim Crow in Champaign County. Now, a year later, we are still fighting against the New Jim Crow here. On any given day 60-70% of those in the jail are Black. They are often there for traffic offenses or minor drug charges. Many have mental health or substance abuse issues. They don’t need a jail, they need a criminal justice system that treats them fairly, and they need social programs that provide avenues to education, employment and treatment programs. We want to put an end to the New Jim Crow in Champaign County by stopping racial profiling, whether it be in traffic stops or in sentencing. And we want to see that the $20 million goes to building human beings, not new jail cells. 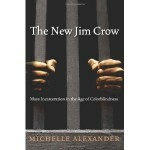 If you haven’t done so already, I urge you to read The New Jim Crow. But if you do, remember that Michelle Alexander is not only talking about New York or D.C. or Chicago. She is talking about what is happening right here in Champaign County. To this end, please join us in stopping the construction of any new jail facilities here. It is one way to help bring this New Jim Crow to an end. James Kilgore is a member of Champaign-Urbana Citizens for Peace and Justice and Citizens with Conviction, a local group that advocates for people with felony convictions. This entry was posted in Policing, University of Illinois at Urbana-Champaign. Bookmark the permalink.